Rev. Peter Barrow moved his family from Mississippi to Spokane, Washington in 1889. Almost immediately upon arriving, he began to involve himself politically and religiously in the city’s early life. According to Union Army Pension Records, Barrow was born a slave near Petersburg, Virginia and as a child was taken to a plantation near Cosita, Alabama. When the Union Army came through the area early in 1864, Barrow took his freedom and reached Vicksburg, Mississippi where he enlisted in Company A, 66th U.S. Colored Infantry on March 11, 1864. He remained in the Union Army until March, 1866. Barrow served in Louisiana and Arkansas during the remainder of the War. Peter Barrow’s political activities included founding the John Logan Colored Republican Club, being nominated for political office by the Populist Party, and helping lead the Farmer’s Alliance Movement in Washington State. In 1890, he and his wife, along with several others, established Calvary Baptist Church, the oldest historically black church in Spokane, where Rev. 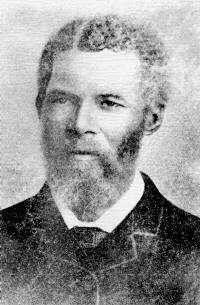 Barrow served as pastor from 1895-1906. In July of 1902, he helped host the Third Annual State Convention of the Colored Baptist Church at Calvary, giving an evening address to the attendees. His life ended tragically, when, as his granddaughter related, “He was killed in a street car accident in Tacoma, where he had gone for a church convention.” But his legacy lives on in the congregation he founded, and in the Barrow family name, which is still inscribed on the cornerstone of Calvary Baptist Church.